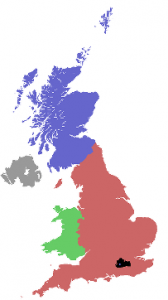 Guildford East District is part of the UK Scout Association. 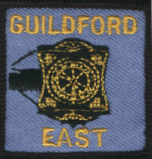 Guildford East comprises over 1000 members in 8 Scout Groups and 6 Explorer Units. Details of their locations can be found on the “Groups” page. Scouting is about the Physical, Mental and Spiritual development of young people between the ages of 6 and 25. Significant emphasis is placed on participation and outdoor activities to achieve these aims. The Cathedral Town of Guildford is situated to the South West of the county of Surrey (marked in black on the picture) and is about 30 miles south-west of London. It is the county town of Surrey and has a population of approximately 125,000 people. It is a historic town with a Norman castle, a medieval Guildhall and a cobbled High Street. The Guildford East Scout District covers an area east of the River Wey from the M25 in the north down as far as Cranleigh in the south. © Guildford East District Scout Council. Registered charity number: 1021177.